All-rounder Shiv Thakor has said he decided to move from Leicestershire to Derbyshire to enhance his prospects of playing international cricket. The former England Under-19 captain has not featured in the County Championship this season and has struggled with finger injury in recent years. He will end a 14-year association with the Foxes at the end of the season. "The main reason, really, was just a foundation to play for England," the 20-year-old told BBC Radio Leicester. "It has been a difficult 18 to 24 months with the finger injury and operations. "I felt it is the right time time for new challenge. For me, it is a fresh start. "Having lost two crucial years it is somewhere I can really go and kick-start my career again." Thakor became the youngest player to make a first-class century in the club's history in 2011, when he scored 134 against Loughborough MCCU, but has yet to play a Championship game this season. 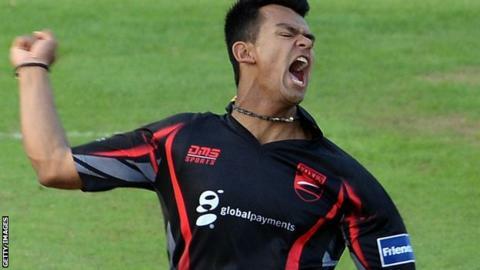 He did make six One-Day Cup appearances, but Leicestershire failed to progress beyond the group stage of both limited-overs competitions this season. Thakor rejected the offer of a new contract and spoke to a number of clubs before settling on a move to their East Midlands neighbours. "I just felt at this stage Leicestershire are in development phase, and I'm sure they will come out the other end of it with some very talented players as there always have been. "Derbyshire stood out with the role they could offer me, the support they could offer and their vision and what they are trying to do. "It went hand in hand with their ambition and my ambition. Going forward they felt they are the club that could take me to the next level."